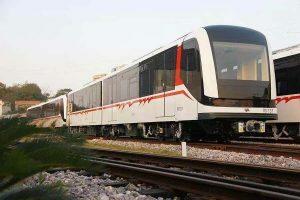 Istanbul government and CRRC ZELC signed a USD 500 million contract for the supply of articulated metro trains which will be put into commercial operation on Istanbul Airport Line. The vehicle has 4 powered cars, a width of 2.65 meters and its maximum operating speed is 80 km/h. It is manufactured according to ISO22163 international railway industry standard. In terms of form and technical interface, the new vehicles are compatible with the existing lines in Istanbul and can operate as driverless vehicles too. In November 2019, the first metro line serving the third Istanbul’s airport is expected to be opened, having connection with Gayrettepe station on M2 with each of the three terminals of the new aiport, which is constructed in the north part of the city. The line will have 37.5 km and 9 stations, and it is constructed by Kolin – Şenbay consortium under a EUR 1 billion contract. The line will run in unattended GoA4 mode, the CBTC being designed for 5 min headways and a maximum operating speed of 120 km/h.